First and foremost I want to quickly talk about what Savage Steve Holland's films have meant to me. I'm sure much of this can be said for thousands of other people, but his films are personal and even though they are mainly filled with hysterical jokes, they are moments that can resonate with most people. Especially people who weren't necessary part of the "in-crowd" in high school. Truthfully, I wasn't a nerd. I had plenty of friends, but I most definitely was no A-lister at my high school. Maybe more like B, which I'm totally fine with. Regardless of my or anyone's status, we all had insecurities growing up in our teens and Savage Steve Holland's films are real good at depicting some of those. Not only that, they are real good at being laugh-out-loud hilarious and endlessly enjoyable. In typical Cinefamily style before our double feature began, employees handed out free beer to attendees. (Yes, free beer!) While the employees handed out drinks and everyone got comfortable in their respective seats or couches, we were treated to animation and clips from the 70's TV game show called 'Press Your Luck.' If you are not familiar, the show featured animated characters called Whammy's. Why show us these clips? Because one of Savage Steve Holland's first jobs was animating the Whammy's. After we were all settled and cozy a short Q&A was hosted by owner and programmer Hadrian Belove who interviewed Savage Steve Holland and a few cast members that were in attendance. Diane Franklin who plays Cusack's unbeknownst love interest was there with the famous coat she wore in the film! Curtis Armstrong who plays Cusack's best friend Charles De Mar was also in attendance. Rounding out the 'Better Off Dead' cast in attendance was Elizabeth Daily (known for her role as Dottie in Pee-Wee's Big Adventure) having a bit part singing the theme song to the movie at the High School dance sequence in a very 80's fashion forward dress. The group talked about how much fun it was filming the comedy. Also how hard it was not to die of laughter while filming such a cooky coming of age tale. Savage Steve Holland was asked about making such a prolific 80's comedy and he retorted by remarking how "cute" it is people felt that way about his films. One thing Mr. Holland mentioned that I found very interesting was at the time 'Dead' was being made, Hollywood wasn't sure about how to approach the teen comedy. Steve Holland referred to the studio as giving him free reign to do whatever he wanted. He later remarked all that changed after both of the films released to less than a warm reception at the Box Office. Before Cinefamily started the first film, we were treated to a student film that Savage Steve had done called "Bouillabaisse." The film is an animated short featuring very similar animation we seen previously in Holland's movies. Similar is style, but not in subject matter, instead of cute and cuddly bunnies with machine guns it revolves around sea creatures. They would melt into one another. I saw it as almost an evolution of amphibians. Some really cool animation, especially for the habitual Savage Steve Holland fan. The films played in release order, so "Better Off Dead" was first. I hadn't seen the comedy in quite a few years, but as soon as the opening credits rolled, it all came back to me and the rest of audience. The film went over without a hitch. The crowd ate it up (some even a little more than others). Savage Steve Holland's first film is his best. As he told the crowd, it is his most personal film and it just replays as such. 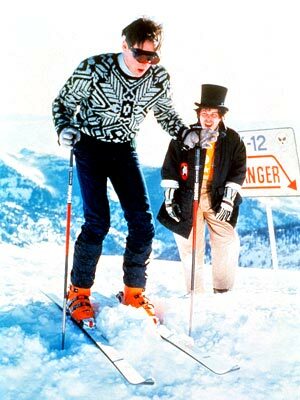 There really is almost too much to love in "Better Off Dead." From Lane's parents and his younger brother to his nerdy neighbor and over controlling mother, everything remains a riot. And that is just the tip of K12. There's Lane's best friend aptly played by Curtis Armstrong, the Asian brothers who are constantly trying to race Lane and the paper delivery boy who is constantly stalking Lane for his $2 dollars. One thing I've always loved about Savage Steve Holland's films is the running jokes and all them still work wonderfully. From "I want my $2 dollars" to "Do you mind if I ask out Beth" each and every one just keep the laughs coming. One last character that must be mentioned is Roy Stalin. The Ski team captain who steals Lane's girlfriend from him at the start of the film. Aaron Dozier is perfect. I knew assholes like him in High School and Dozier pulls it off expertly. That fake smile, the cringe worthy jokes and posse, memories and people I don't care to remember, but Steve Holland's film turns them into a laughing stock. Thanks Steve. After "Better Off Dead" ended Cinefamily invited everyone in attendance to the back patio for more free beer and barbecued hamburgers. The hamburgers were a real nice touch considering Lane Meyer had a job working at the local Burger joint. The burgers did cost a mere $3 dollars and despite a few snickers that they should've been $2, the idea was executed well. During intermission all of the actors and Savage Steve Holland were very approachable and were taking pictures and signing fan's DVDs. After short amount of time the theater signaled that "One Crazy Summer" would begin shortly and slowly everyone began making their way back to their seats. 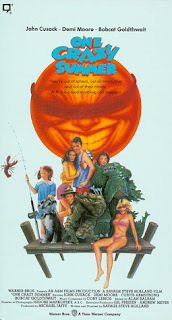 "One Crazy Summer" also played real well with the crowd. Some of the energy was lowered from 'Better Off Dead,' but it was also getting late. I'm a bigger fan of 'Dead' than 'Summer' and Savage Steve Holland seemed to indicate he felt the same. From one reason or another, 'Summer' doesn't feel as cohesive and personal as 'Dead' does. 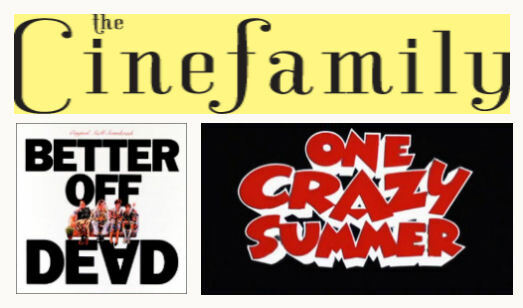 That is not to say 'One Crazy Summer' isn't awesome, because it still is one of my favorites movies, it just doesn't have the same fire that 'Better Off Dead' continues to have. Honestly they are both timeless wonderful pieces of cinematic history. All evening you could tell how sincerely happy Savage Steve Holland was that these movies have found their niche and have made so many people happy. He was a super genuine guy that deserves all the praise. A couple interesting notes Holland told the crowd about 'One Crazy Summer.' First, and this seems obvious, the comedy is his love note to "Jaws." Holland is a big fan of Jaws and wanted to deliver his own homage to its importance. One eyebrow raising story Savage told the crowd was that John Cusack basically checked out about halfway through filming. 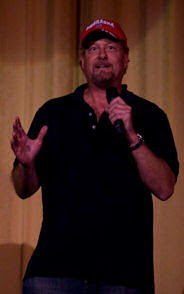 Steve Holland illustrated to the crowd that the film slowly began to lean towards the Stork twins, more particularly Bobcat Goldthwait, because Cusack became unengaged. The thought that John Cusack doesn't like these movies is appalling. These movies mean so much to me and thousands of others that it is mind boggling to think that he doesn't enjoy them. Cusack has had a career I envy. Numerous films that heavily swayed pop culture and to dismiss these two gems, just seems, well insane. Wrapping it up, gotta thank the Silent Movie Theater and Cinefamily for hosting such a cool event. Loved seeing and hearing Savage Steve Holland in person, not to mention see him watch his movies and still get a kick out of them. It was an awesome experience seeing these two pivotal coming age comedies on 35mm with a crowd that respects and admires them as much as I. One last note, if you are in the Los Angeles area, be sure to checkout Cinefamily's schedule. They always have great programming and a cozy environment to see them in. Actress Diane Franklin is working on her autobiography and has been asking her fans for suggestions that can be used for it (questions about her career, etc.). 1.) Holland has worked with Diane on three different projects ("Better Off Dead", "Encyclopedia Brown and the Ghostly Rider" and "How I got Into College"). 2.) Holland once described Diane as being "cute, like Bambi on acid" when trying to explain what it was like to meet and work with her for the first time, which to me remains the unusual metaphor that has ever been used by a director in describing Diane Franklin - or any other actress, for that matter lol.